Cisternino lies on a hill in the beautiful Murgia Valley, also called the Valley of the Trulli. The small town is full of traditions and history and offers an enchanting old town with small shops and numerous bars and restaurants, some of which even offers the ancient cuisine. From here you can make a bike ride along the streets circumscribed by dry stone walls and interesting excursions e.g. to Alberobello, Grotte di Castellano and Ostuni. The beautiful coastline with miles of beaches, sandy and rocky, is also only some minutes away by car and is definitely worth a visit. All in all Cisternino is a wonderful place to come to know and to love the typical daily life of the locals. 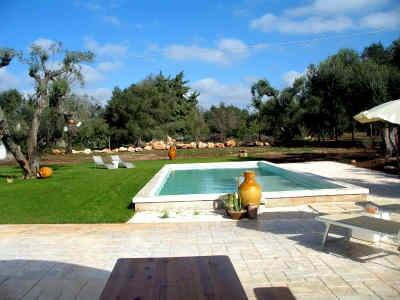 The apartment is located in the heart of Cisternino, on the place Vittorio Emanuele in the characteristic Old Town. Bright and nicely furnished, it offers you a beautiful holiday home on 3 floors. From the rooftop terrace, you have the possibility to observe the bustle on the square with his known bell tower. The old town of Cisternino is traffic calmed. The apartment is reachable till 50 m by car.please note, that take place mostly during the summer months, many events in the“piazza”. The price includes water, gas for cooking, current, bedlinen, towels, final cleaning. Payable on site: seucrity deposit € 100.00, heating according to consumption.